Watch The Toasted Ponies on YouTube. 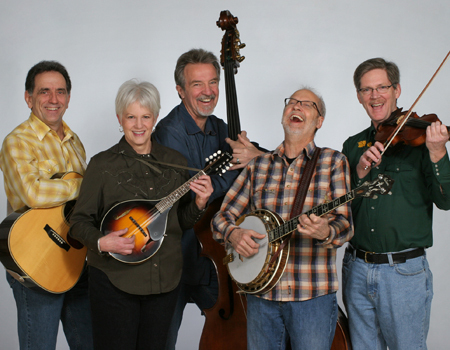 The Toasted Ponies combine the best of both traditional and contemporary Bluegrass music. Look for great harmony singing and hot instrumentals in a typical Ponies performance. These musicians are seasoned professionals who love playing their music and it shows. They will play everyone's Bluegrass favorites along with a fun mix of Cajun, Western Swing, Gospel and Celtic tunes just to keep things interesting. The Ponies are equally at home on a formal concert stage or at a barn party, county fair or community picnic. Just try seeing the Ponies show without tapping your toes -- it can't be done! The Toasted Ponies will perform two 45-minute sets with a 15-minute intermission. The show includes the banjo, guitar, mandolin, fiddle and bass. In addition to the primary concert performance, the Ponies will play a short acoustic program at a local nursing home or senior center at no additional charge. Technical Requirements: Space of 10' x 15' with grounded electrical outlets. In an outdoor setting, shelter for microphones.